23 word Valentine's puzzle. 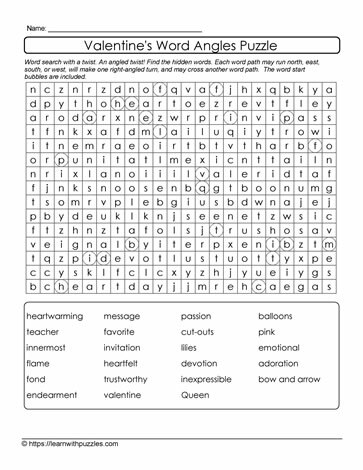 This Valentine's Day word search has a unique twist. Each word, hidden in a grid, has a right angled in its solution. Start bubbles locate the beginning of each word found in the wordbank. There is only one right angle per word in the grid. Words can be found in all four directions: horizontally, vertically, forwards and backwards. Differentiated instruction helps support English language learners and struggling readers. Puzzles support all classroom platforms: regular, home schooled classrooms, digital and Google platforms. Complement elementary 3,4,5 grade language curricula with these theme related puzzles to support learning.